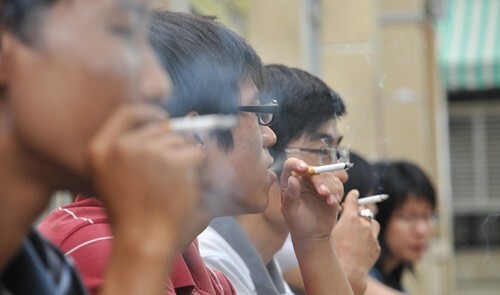 This file photo shows some Vietnamese young people smoking. In addition, smoking also costs Vietnam VND22 trillion (US$1.03 billion) every year, which is spent by smokers on cigarettes, according to the ministry. Smoking is among the leading causes of mortality in men in Vietnam, with nearly 11 percent of the total deaths in men caused by smoking-related diseases, according to the statistics of the health sector. According to the Global Adult Tobacco Survey (GATS) in 2010, 47.4 percent of men and 1.4 percent of women (aged 15 years and up) in Vietnam are smokers. This means that more than 15 million adults are smokers. For every two men over 15 in Vietnam, there is one smoker, Dr Phan Thi Hai, deputy chief of the above program, citing the World Health Organization (WHO), said. In addition, 73.1 percent of adults in Vietnam are exposed to secondhand smoke at home, and 55.9 percent of adults are exposed to secondhand smoke at work. Smoking is the leading cause of death in the world and is responsible for the deaths of nearly six million people throughout the world every year. In Vietnam, about 40,000 people die of smoking-related causes each year, according to GATS. Many studies have indicated that the smoke from a burning cigarette contains more 4,000 chemicals, of which over 200 are toxic substances and additive substances, especially nicotine.